The Luxembourg flag was adopted in 1972. It is based on a design that was influenced by the French flag. 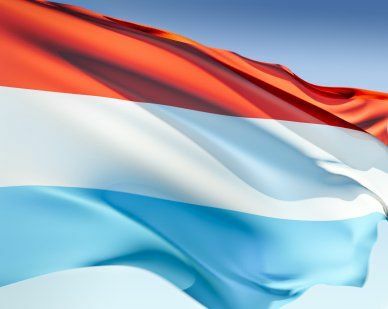 The colors of the Luxembourg flag originate from the coat of arms of the Grand Duke of Luxembourg, Count Henry VI. The flag's horizontal stripes were designed in 1845 about ten years after Luxembourg declared independence from Germany. The top red stripe signifies blood lost in gaining independence. The middle white stripe represents peace and harmony. The bottom blue stripe symbolizes the sky and unity. Our top-quality Luxembourg flags conform to all official specifications. Emblems and designs are executed with the highest possible degree of accuracy in regard to detail, color shades, placement and proportion to flag size.